A robbery suspect, Azeez Folarin, has narrated how his house furnished with the proceeds of crime was burgled in Ibadan and the items carted away by robbers who apparently had no respect for one of their own. 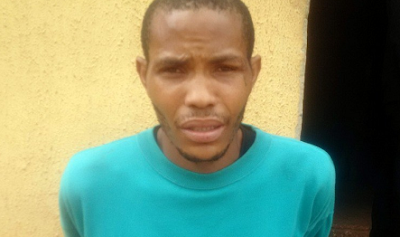 The 25-year suspect, popularly known as I-Pad, exclusively spoke to Premium Times today at the Federal Special Anti-Robbery Squad, FSARS, Ogun State Headquarters in Abeokuta where he is being held. He said he had been operating in the underworld for over two years and belonged to a robbery gang operating in Lagos, Ogun and Oyo states. According to Mr. Folarin, he rented an apartment in Ibadan and furnished it with items, including electronics. Asked how he felt after his property was carted away, the suspect who is a drop out of Ogun State College of Education, said he felt hurt‎ and shocked that such could also happen to him. He, however, said the incident did not weigh him down much as he continued his trade in the underworld until he met his Waterloo during a robbery operation on February 25‎. He said his gang had robbed a man in Ibafo area along the Lagos-Ibadan Expressway when nemesis caught up with him days later. Other members of the gang are still on the run. Mr. Folarin said he was introduced to robbery operation by a friend who is still at large.